An exciting and very unique live show heads to Melbourne this summer, which is set to wow the youngest in your family to the oldest. Air Play, is performed by world-famous clowning duo the Acrobuffos, arriving in Melbourne straight from New York City. 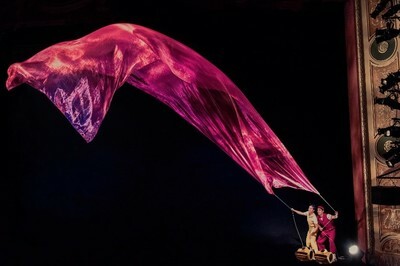 In a hilarious but also breathtaking spectacle, the comic duo; Seth Bloom and Christina Gelsone, throw some rather remarkable sculptures into the air of the Arts Centre Melbourne’s State Theatre. Air Play mixes physical comedy with extraordinary air sculptures of artist Daniel Wurtzel, to create a spectacular performance as hilarious as it is heart-warming. What can you expect to see? Flying umbrellas, larger-than-life balloons, kites that float over the audience and an enormous snow globe are just some of the treats you will be exposed to.